I'm in the market for some new heavy duty straps for trailering my atv. 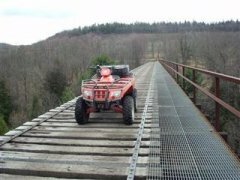 Whats everyone using to tie down their atv while trailering? 3/4" , 1" , 1 1/2", 2" straps? I had a couple of cheap 3/4" straps break on me , all i had at the time, I felt pretty lucky pulling into the gas station with the quad still on the trailer. I use one inch straps, but check the rating on them, the material is much thicker then the cheapo ones. Auto part stores usually have good ones. Last month I bought these at home depot for $20, they work well. Needed a new set. Use quality ratchet straps. Avoid the push release gripper types. For me redundancy is important. Some areas we haul into have rough roads. I use a minimum of 4 straps to secure a wheeler on a trailer. Never broke a strap but have had hooks pop off. When able, I'll bypass the hooks and run a strap through a D-ring and the wheeler attach point. Actually, I prefer rope. The Navy taught me how to lash things down very securely with rope. However it takes time and my wife and kids won't be bothered to learn it. I use 1" but the load info is important as anything. I have a hook welded on my trailer and my winch secures the front end to that and then I strap the back with straps I bought at Menard's 500# work load each. Love my idea for front with the winch. It ain't never coming lose from that!